For those who are not yet used to handling sheepa session can be held prior to the course to demonstrate and practice sheephandling techniques. Carried out all these movements with a minimumof disturbance and stress to the sheep, whilst keeping them under the control. The way the course is run may vary to suit localcircumstances. Usually the course lasts for 6-8 sessions at fortnightly intervals, with a group of 4-6 people takingpart. The venue will be a suitable farm or centrewithin reasonable travelling distance. The course may be run for individuals ontheir own farm and special arrangements can be made for this. This is based on demonstrations and "havinga go" yourself and will cover the aspects shown under the aim of the course.The exact content of each session will vary according to the progress madesince the previous one by course members and their dogs. It is recognisedthat not all dogs or handlers will progress at the same rate this is takeninto account. Each participant of the course will be instructedindividually and have an opportunity to practice each of the skills demonstrated. 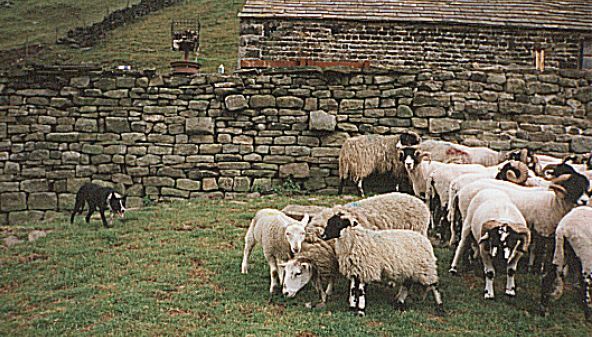 To get the most from the course you should,Have a dog that is suitable for training, normally under 2 years old, showingan interest in working sheep. It should be in good health, recently de-wormed,fully vaccinated and accustomed to car travel. You will also need a check cord approximately25 meters long, and attached to the dog collar. Be able to practice regularly between instructionalsessions THIS IS ESSENTIAL. My two year old Lightfoot black Trim, working in Thursden Valley at clipping time.